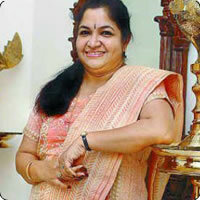 Popular playback singer KS Chithra has been awarded the Sakkulathu Amma award this year. Every year, the Bhagavathi Amman Temple Trust in Kerala will choose a person proficient in various arts and present them with the prestigious Sakkulathu Amma award. This year, Chithra has been identified for the honor and she received the award from Manikuttan Namboodiri, the trustee of the temple premises.